MANILA, January 31 (PIA) –- Public Works and Highways chief Secretary Rogelio L. Singson assured that P10.817 billion will be spent this year to carry out long term solutions to the country’s flooding and other water-related disasters. Singson said DPWH will be giving priority to water catchments and impounding structures upstream of major rivers. “In highly urbanized areas, climate change initiatives, and rehabilitation of flood-damaged structures will also be given priority,” Singson added. According to the DPWH, among the identified major flood control projects for implementation this year are the Pampanga Delta & Pampanga River projects; Laoag River Basin and Sabo Project; Bicol River Basin and Watershed Project; Mindanao River Basins; Mandaluyong City drainage improvement project; Cagayan de Oro River Basin; Pasig-Marikina River Channel Improvement Project (PMRCIP), Phase II; Mt. Pinatubo Hazard Urgent Mitigation Project, Phase III; San Roque Multi-Purpose Project, Flood Control Component; and drainage protection works along national roads and bridges nationwide. The DPWH will also continue prioritizing flood control projects in major and principal river basins based on completed master plans this year. “We will continue the promotion of innovative technologies such as geotextiles and coco-netting in slope protection and soil erosion control; promotion of rainwater harvesting and retarding basins; and support other agencies’ efforts in non-structural measures such as hazard mapping of the DENR, flood monitoring and forecasting of DOST/PAGASA, and relocation of informal settlers living along river ways and esteros,” added Singson. 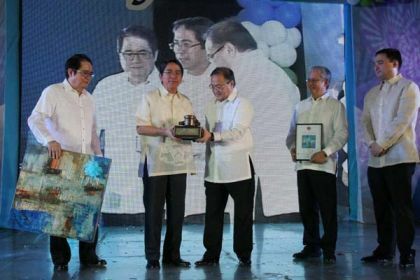 In August last year, President Aquino lauded the use of coconet technology in rehabilitation of esteros and other waterways. The highly indigenous geotextile material made from discarded coconut husks can be used as fender to control soil erosion, slope protection or stabilization, embankment, and shore protection.